Interesting Texts Preserved For Posterity: A court case forced a Santeria priest to reveal some of his religion’s secrets. Its ritual of animal sacrifice, he revealed on his own. Web extra: More photos from the feast day at Jose Merced's home. The Euless neighborhood is mostly quiet, a sleepy suburb of pleasant ranch-style homes, winding creeks and mossy oaks that looks as if it could have been plucked from any American city. Except, of course, for the ancient gods that populate the home and religion of one of the area's most controversial residents. But Jose Merced doesn't shy away from controversy—and he has no plans of doing so on this crisp day in late September. No matter that his neighbors remain uneasy with the ritual singing and drumming that are part of his Santería religion; no matter that they might, as before, call the police if they feared he was engaging in animal sacrifice; no matter that the city of Euless, even after losing a drawn-out lawsuit that tested the boundaries of religious liberty in Texas, is still searching for new ways to shut down Merced's spiritual practices. For him, the deities who reside in the back room of his house have been silenced long enough. It's been nearly three and a half years since he stopped the ritual slaughter of four-legged animals in his home to pursue litigation against the city over his right to do so. With a decision from the 5th U.S. Circuit Court of Appeals in his favor and against the city's health and safety concerns, Merced, a flight attendant, will resume his full religious practices tonight. As the sacrificial hour approaches, several priests (Santeros) are preparing the 40 assorted goats, roosters, hens, guinea hens, pigeons, quail, turtle and duck who grow noisy and nervous in their cages. Their lives will be taken in an exchange mandated by Olofi, Santería's supreme god and source of all energy, to heal the broken body and spirit of Virginia Rosario-Nevarez and to initiate her into the Santería priesthood. No medical doctor has been able to alleviate her suffering—the intractable back pain that makes walking unbearable, her debilitating depression and loneliness. Mounted against a wall in the back room shrine in Merced's house are shelves containing clusters of small ceramic pots, ornately decorated and filled with shells, stones and other artifacts—the physical manifestations of the Orishas that reside in the room. To initiate Nevarez as a priestess, new godly manifestations of the old gods on Merced's shelf must be born. To make this happen, animal blood will be spilled onto new pots, which the priestess will take home to begin her own shrine with her own newly manifested gods. Much of theology behind Santería's rituals remains unknown to Nevarez, though more of its secrets will be revealed to her as she grows in her commitment. Secrecy defines the Santería religion, which is why estimates, even by its own followers, of the number of its U.S. adherents vary widely between one and five million. The religion's clandestine nature was also a point of contention during the lawsuit. At trial, the city asked Merced if its health officials could witness a sacrifice to determine if it violated Euless' ordinances prohibiting animal cruelty, the possession of livestock and the disposal of animal remains, but Merced said only initiated priests were permitted to see one. The exclusion of outsiders stems from the long history of persecution Santería's followers suffered. Santería came to Cuba from West Africa during the slave trade centuries ago, a peculiar melding of the Yoruba religious traditions of captured slaves and the Catholicism of their masters. Slaves were forbidden from practicing their indigenous beliefs, so they hid that practice from their oppressors, adopting the names of Catholic saints for their Orishas (Saint Peter for Ogun, for example) whose divine intervention they could call upon when seeking protection, health and wisdom. "I'm going to let her see one and that's it," he says, standing in front of a long, flowing curtain concealing the entrance to his shrine. He is unwilling to listen to any who oppose the outsider observing the ceremony. Some in the shrine raise their eyebrows but return to the task at hand. They figure Merced's deities are in control today. If he's allowing the Orishas to be seen by a nonbeliever, then the gods must be OK with it. Merced folded his arms defensively across his chest. Time and again, throughout his legal troubles, lawyers, neighbors, friends and even Santeros had proposed he do the same. Why didn't he just leave Euless? Worship somewhere else? Why come out and create so much controversy when he could just keep things secret and live in peace like the others? To Merced, this spirit represented an insult to everything he had accomplished. "How dare you?" accused Merced, reminding the spirit that it was "immaterial"—and in Merced's house. "I don't have to go anywhere. I'm going to keep up the fight." He grew up in San Juan, Puerto Rico, and recalls his childhood as happy and stable—that is, until his father left the family. Merced, at 12, felt abandoned and grew physically ill, developing a sharp, chronic pain in his stomach and intestines. A medical doctor suggested exploratory surgery, but his mother wouldn't hear of it. At 14, he donned his collares—necklaces that represented the protection granted by the Orishas. For a short while, Merced, who weighed 210 pounds, began to feel better, but it didn't last. "Spirits also can bother you when you're not knowing or understanding what it is you come in life to do," he now explains. Finally, Merced says that the Orishas spoke through the woman and told her that the only way to make his pain disappear was to get initiated as a priest. Merced was ready, but the ceremony was expensive, $3,000, and he didn't have enough money. For a year after graduating high school, Merced saved up, working as a clerk for the Puerto Rico Department of Education in San Juan. By early 1979, with his mother's help, he had saved enough money, though he still had no idea what to expect. He had helped with other initiations at his godmother's house but was never allowed inside the shrine-room. "I saw the animals going in alive and coming out dead," Merced recalls. But he had no idea why. He helped by cleaning or cutting up the meat or plucking chicken feathers. Sometimes he would ask the people outside the room what was happening inside. "And when you asked something, all they answered was, 'It is a secret.' If you're not crowned [a priest], you're not supposed to know. So when I went in to my ceremony, I didn't have a clue." After the crowning ceremony, it was time for the animal sacrifice. As the animals were brought in, he was told to touch his head to the animal's head and its hooves to other areas of his body. The animal was absorbing his negativity. He had to chew pieces of coconut, swallowing the juice but spitting the coconut meat into the animal's ear. He would later learn that this was necessary for the "the exchange ceremony," which came next. 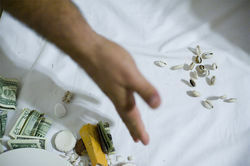 The pieces of coconut represented Merced's message—his thoughts, feelings, needs—which were transferred to the goat for direct passage to Olofi. His physical contact with the animal was also symbolic of his commitment to God. As soon as the animal's blood was spilled, Merced's negativity, which had been absorbed by the goat, was released. The purified blood then spilled into the pots. Shortly after the initiation, he says his stomach pains subsided. "I never, ever have felt again the same pain that I used to feel before," he says. Although he had little contact with his father, a nonbeliever, he invited him to his divination readings two days later. His father also visited him at his mother's house immediately after the seven-day ceremony concluded. Merced was wearing all-white, his head shaved clean, and his father insisted this was all his mother's doing—she was the one who had become a priestess a year earlier. His father demanded he end these religious practices and join the National Guard like he had. Merced told him, no: He had become a priest for health reasons, and he refused to let him shake his faith, particularly after his father had been so uninvolved in his life for so long. He didn't know any Santeros here and removed his necklaces to avoid drawing attention to himself. "I didn't want people to know [about my religion]," Merced says. "That's hiding. And I lived hiding for a long, long time." Over the years, he would become godfather to at least 500 followers and initiate at least 17 priests. As these new priests went out into the community and gave out necklaces to their own godchildren, Merced's own house grew. 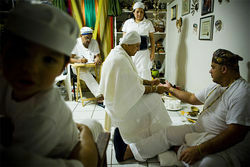 He estimates that today there are close to 1,000 believers in his Santería community. As Merced grew more confident in his job and in himself, he stopped hiding his religion to outsiders and would tell them about it when asked. He took the same approach in his personal life. And in 2002, when his boyfriend, Michael, decided to take his last name, their commitment to each other seemed a natural progression. "This is me," Jose says. "And everyone will accept me for what I am." In 2002 Merced moved into the house he currently owns in Euless, but it wasn't until 2004 that he started attracting the attention of the authorities. On September 4, Euless police and animal control officials showed up unannounced at his home. An anonymous caller had complained that goats were being illegally slaughtered in his backyard. When the authorities arrived, Merced was in the middle of a sacrificial ceremony inside his shrine. The police told him to stop—that if he didn't they would fine him or arrest him. But the animal control officer intervened: Merced was allowed to continue the ritual and would not be arrested, at least not that day. The incident was only the beginning of a lengthy legal struggle that would thrust this otherwise private man into the national spotlight. In May 2006, authorities again appeared at Merced's home, responding to a neighbor's complaint that he was preparing to kill goats. But Merced and a friend were just sitting outside, celebrating another Santero's birthday with a beer and a cigarette. Merced invited the authorities to search his backyard for goats. Only two small dogs came running. Merced recalled what the police told him in court: "They said, well, if you're not doing it today, make sure you don't do it tomorrow, either, because you cannot do it." Shortly after the second complaint, Merced went to Euless City Hall and asked for a permit that would allow him to perform animal sacrifices. City staff said no such permit existed. With the threat of arrest looming, Merced felt he had no choice but to sue. In December 2006, Merced, through his attorney John Wheat Gibson, sought an injunction in a Fort Worth federal court prohibiting Euless from preventing him from exercising his right to practice his religion. The suit alleged that the city had violated the First, Fifth, and Fourteenth Amendments as well as the Texas Religious Freedom Restoration Act. Because his case was the first to invoke the act's protections, Judge John McBryde had no precedent upon which to rely. During the one-day trial, Merced took the stand and told the judge: "I just want to practice my religion. I just want them to leave me alone as long as I'm not harming anybody or it's not a risk or causing damage to anybody in the neighborhood." Merced and a defense expert testified that the location of initiation ceremonies was divined by Santería deities and that Merced's deities requested those ceremonies be held where they lived—in his home. But Merced also told the court that he had conducted initiation ceremonies outside of Euless—a fact the attorney representing Euless, William "Mick" McKamie, seized upon in his argument. "When you're looking at the overall practice of the religion, that's one aspect of it [and] it can be practiced elsewhere," he contended. 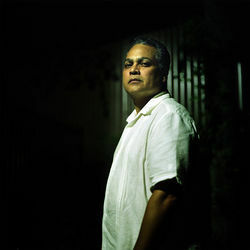 "Mr. Merced moved into this place where it was illegal instead of selecting a place that wasn't. And so he burdened himself." The judge agreed that Merced's sacrifices could be performed outside of Euless and ruled against him. Gibson was convinced the decision was wrong—that McBryde was unable to rule in favor of a religion so alien to his own belief system. "I think what happened in Euless is that we have people who don't understand what the Santeros are up to," Gibson says. "It's not that they're against dogma; it's just that this is the wrong dogma." Merced took the decision as one more instance of people insisting he was the problem, and if he would only move, he would be free to practice his religion in peace. Outraged, he decided to appeal. The case gained recognition, embraced by religious liberty lawyers who sought a more expansive interpretation of the Texas Religious Freedom Restoration Act. Enacted in 1999 under then-Governor George Bush, the TRFRA prevents Texas state and local governments from "substantially burdening" a person's free exercise of religion unless that government can show a compelling interest in doing so. The law was a reaction to a 1990 U.S. Supreme Court decision in a Native American peyote-use case, which held that the First Amendment did not prohibit the state of Oregon from banning the sacramental use of peyote through general criminal drug laws as long as they do not specifically target Native American religious ritual. It did say, however, that the legislative process could be employed to protect the free exercise of religion. Congress took the court at its word and in 1993 passed the Religious Freedom Restoration Act. But the Supreme Court fired back with a 1997 ruling that said it was unconstitutional to apply this federal law to the states. So at least 14 states, including Texas, took it upon themselves to pass similar laws protecting religious freedom. First Amendment scholar Doug Laycock, a law professor at UT-Austin at the time the Legislature enacted the TRFRA, said its authors intended the law to be expansive and apply to all religions, even the ones "the Legislature has never heard of." So when Merced decided to appeal his case, he called Laycock. But Laycock, now a law professor at the University of Michigan, had other obligations and couldn't take the case. He assured Merced he would find him representation. And fast. The deadline to appeal was approaching. Laycock contacted Plano-based Liberty Legal Institute, a nonprofit First Amendment law firm with a history of advocating conservative causes. But the firm already had one TRFRA challenge before the Texas Supreme Court and didn't want to detract attention from it. The conservative 5th Circuit also had an abysmal track record when it came to religious liberty claims, especially those that had been adversely decided by its lower courts. Within days of the deadline, Laycock found Eric Rassbach, the national litigation director at the Becket Fund for Religious Liberty in Washington, D.C. Legal Liberty's director Hiram Sasser also helped Rassbach prepare for his oral arguments, stressing the importance of making the judges comfortable with animal sacrifice in the context of religious freedom. "That's always the hardest part about handling a case that involves weird facts," Sasser says. "Everybody has to understand that their religious freedom is tied together." Rassbach hit that point hard during his arguments before a three-judge panel of the 5th Circuit, which on July 31 ruled in favor of Merced and ordered the lower court to issue an injunction against the city of Euless. The panel didn't decide the case on First Amendment grounds but rather on its interpretation of the TRFRA. In an August 7 Wall Street Journal op-ed entitled "Why I Defend Goat Sacrifice," Rassbach praised the appellate court for championing religious freedom. "The Court did not decide whether Mr. Merced's beliefs were right or wrong, orthodox or unorthodox," Rassbach wrote. "It simply held that as long as he is not endangering public health or safety, the government had to leave those beliefs up to him and his gods." The litigation had taken its toll on Merced. His testimony and the media attention that followed brought many of Santería's secrets into the open and unnerved those devotees who saw its mystery as part of its theology as well as its enchantment. He had written letters to the several hundred Santeros he had met over the years, asking each to contribute $100 to his legal defense fund. But many turned him down. Some were fearful that his case would reveal the secrets that gave power and meaning to their religion; others felt his case was his own personal crusade and not a cause for all who practice Santería. "They want to keep on hiding," Merced says, "which I don't understand." Many of his co-workers at the airline started to give him strange looks, avoiding him altogether. But most painful was the disappearance from his life of friends unrelated to Santería, whom he had known for more than a decade. They had visited his home many times for parties, but had never entered his backroom shine or the converted garage where he practiced. "See, it's not my business card saying, I'm Jose Merced, and I'm a Santero." With the lawsuit, he also isolated himself. "I was just sharing with Santeros. I put shields up." One relationship grew stronger though, as he and his partner Michael completed the process of adopting a baby boy from Guatemala. Suddenly his own father could read about him on the Internet or watch his interviews on CNN. After he won, his father wanted to know what the decision meant. "I didn't sue for money, I sued for religious rights," Merced told him. "It means that I can practice at home and they can't bother me...I made history." Michael also saw the case as a huge victory for religious freedom and thinks the reaction from some in the Santería community is unjustified. "I would hope that this is a turning point for [them] not to be ashamed of the religion you believe in," he says. "[Jose] has to be commended. If it wasn't for him, who would fight?" Doug Laycock hopes that with another win under its belt, the Santería community will feel more protected. "Now there're two decisions, and city attorneys will be more inclined to tell their clients they're just wasting their time and money." That hasn't proven true, however, with the city of Euless. Even though the lower court issued its injunction on September 16, Euless' attorney McKamie sees the adverse ruling as a minor hiccup. "We are going to look at our ordinances as they're written in light of the court's ruling and see if they can be rewritten," he says. "Also, we are going to coordinate with other state and county officials on the enforcement of their laws, not just city ordinances." McKamie says he has seen Merced's property and does not think there's enough land there to keep and kill animals. "Oh my goodness, this is next door to homes! It's not like there's some kind of buffer zone there or anything...Keeping them inside a house, and killing them with blood and waste inside the house, that's a major league health problem." McKamie is considering an appeal to the U.S. Supreme Court, convinced the 5th Circuit Court misinterpreted the TRFRA. "I think it was never intended to be perverted in this way." He is shocked that the court didn't find Euless' public health interests compelling enough to "burden" Merced's religious practices. "How can you say the public health is not compelling? Protection of the public health is the definition of a compelling interest." Several state statutes deal with the public health concerns of slaughtering animals in an urban setting. "It's not just something simple as 'Oh, trust me, I'm going to kill this animal correctly, and by the way, I'll double-bag it.' That's almost insulting it's so simplistic." During the trial, McKamie raised the issue of animal cruelty, but the defense countered that the Santería method of animal sacrifice—cutting the carotid artery—was a humane way of slaughter. It would be difficult for the city to prove that killing animals in a ritualistic manner, such as the Jewish faith does, is crueler than killing animals in a slaughterhouse. None of this will stop McKamie from exploring animal cruelty concerns as he retools his attack. But redrafting health, safety and zoning ordinances or convincing state and county authorities to investigate Merced for other violations smacks of targeting Santería and may run afoul of constitutional protections. Merced insists he will keep practicing his religion openly, even at the risk of being threatened or arrested, or being shunned by followers and friends. Merced throws back the long curtain at the shrine's entrance, for the first time allowing a non-believer to witness an animal sacrifice in his home. 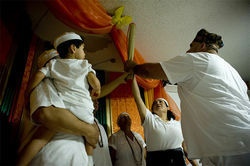 The ritual will mark the dramatic climax of the second day of Virginia Rosario-Nevarez's weeklong initiation. Other Santeros are hard at work preparing the first animal. The men and women all wear white—hats, bandannas, shirts, skirts, pants, socks and shoes. Only Nevarez wears color—a yellow satin robe draped over a long skirt. Her head has been shaved, painted and adorned with a crown. Merced disappears into another room, and then yells, "Ahí va el primero!" The first goat, a black and white male, is carried to the shrine and placed on the white tile. A woman presents it to Nevarez, lifting its front legs into the air. Nevarez leans forward and cups the goat's small head between her hands. She whispers into its right ear. Her lips move quickly. The goat relieves itself on the shoes of the woman behind her. The mess is swept up and the goat is picked up—its front legs crossed with its rear to prevent it from struggling. A broad-shouldered man is handed the goat to hold. On the floor in the middle of the room sits a group of Orishas, their physical presence represented by open pots containing shells and miniature axes, spears and carvings of roosters. Above these Orishas, the goat is suspended on its side, as the other Santeros retreat into the room's shadows. The high priest (Babalawo) picks up a sharp blade and braces the head of the goat. He pinches the skin on its neck and brings the knife in close. He cuts its fur, letting its shavings fall onto the heads of the gods in anticipation of blood. As the Babalawo begins to sing a Yoruban song, his knife forcefully enters the goat's neck so its esophagus remains untouched. Blood collects on the blade and spills off its tip. The broad-shouldered man holding the goat moves with the Babalawo as he feeds the Orishas, pouring blood into each container. The goat's tail continues to wag and the men and women begin to sing. After several minutes, the Babalawo lays the goat on the floor. He completely severs the goat's head and shakes its body over the Orishas to catch any remaining blood. He turns its head upside down and places it on the floor beside the Orishas. Next, roosters and pigeons are brought in, and then another goat. The ceremony repeats itself for the next two hours until all 40 animals are killed. After each Orisha is fed, the animal carcasses are taken to an enclosed patio where the remaining live animals are kept in separate cages before slaughter. Ten people are set up in stations here, skinning goats, plucking chickens, carving up body parts and separating meat from bone. The smell of animal waste and flesh is strong on the patio. Merced would rather this be done outside, but he has yet to receive a copy of the injunction and wants its security before he risks offending his neighbors. The next day calls for another long ceremony. Twice as many Orishas sit on the floor, with fruit, sweets and money baskets laid beside them as offerings. The Orishas are now covered by hollowed-out gourds brimming with cooked animal feet, legs and heads. The odor emanating from them is strong only up close and smells of fried skin and hair. Nevarez seems rested today. "I feel very calm," she says. "It's a new life. The old ways are gone." She looks forward to being healed from what doctors could not cure. She holds her head proudly and relishes the formal greeting process, which has her blessing each visitor who enters the shrine. After the greeting ceremony, musicians enter the shrine, followed by Santeros who dance to the beat of the drums and the songs sung by the Babalawo. In the kitchen the meat waits in pots, separated by the type of animal—goat, chicken and lamb—being prepared for a large feast. From out of nowhere, a squad car pulls up in front of the house and waits. Merced rushes outside, pointing to his neighbor's house. A Euless police officer explains he received an anonymous call over his radio—something about a blocked driveway. Merced turns to the driveway of his next-door neighbor, whom he suspects has been the anonymous caller all along, and notices a car has blocked its entrance, just slightly. The police officer seems friendly enough. "I'll tell you what my call screen says." He reads from it: "Vehicle white truck blocking drive way. People in backyard have been chanting all day and all night and have been known to sacrifice animals." Merced throws his head back and laughs. He invites the officer to look for himself and when he approaches the house, the musicians stop playing. But Merced urges them to continue. In the meantime, he leads the officer inside the house and straight to the shrine. "The police came to visit!" Merced announces. "Say hi!" Nevarez, unsure of how to react, lifts her hands and folds them diagonally across her chest in ceremonial greeting. The officer looks at the shelves of pots and the new priestess, and squeezes himself back outside. "It's different," the officer says to Merced, as they tour the backyard in search of animals. "You know how people are with different. They just don't like different." The officer is satisfied and returns to his squad car, driving away. Merced glances toward his neighbor's house. "If they're trying to put pressure on me in order to get me out of here," he says, shaking his head. "I'm not moving."